Andy and Nancy Raatz launched into missions in 2002 after 12 years of pastoral ministry, clearly sensing God’s call to the mission field. 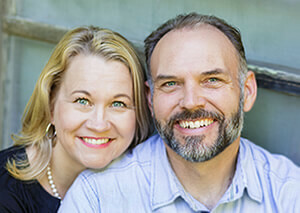 They moved from Montana’s Big Sky Country to rustic Moldova, where they planted churches, served as AGWM country directors, and established Freedom Home, a long-term aftercare home for survivors of human trafficking. Those ten years were both exciting and challenging. Andy and Nancy served an additional four years as AGWM area directors for Russia and Belarus, residing in beautiful St. Petersburg, Russia. Since 2016, Andy has served as director of AGWM Communications, and Nancy works with AGWM Member Care. Andy and Nancy have three daughters – Elissa, Natalie, and Lauren. Elissa is a kindergarten teacher in Springfield, Missouri. Natalie studies at the University of Tulsa, and Lauren is a proud Bulldog at Central High School in Springfield. Andy loves reading, photography, hunting, and the outdoors. Though he loves travel and seeing new places, his favorite place to be is with his family in a quiet cabin on a lake. Andy has a B.A. from North Central University and an M.A. from Assemblies of God Theological Seminary. Nancy is proud of her Finnish heritage and loves cooking and walking her dog. An ordained minister and accomplished speaker, she is passionate about ministry to and with women. She has a B.A. from the University of Minnesota and an M.A. from the University of Valley Forge.